A FREE person to person funds transfer program. Easy access through Account Manager in Online Banking or our Mobile App. "Everything in a one stop shop!" Every time I log into Online Banking, I can do everything I need: check my balance, pay my bills, receive notifications, open new accounts... AND it's FREE!!! Does it get any better than that? For many people, using cash or checks has been the easiest way to pay a friend or acquaintance. However, more and more people are using their smartphones or other electronic devices to make purchases and manage their finances. Introducing People Pay – a new way of sending money that’s fast, convenient and safe. Manage all your payments in one location without slowing down your busy lifestyle. DCU People Pay is the fast, safe way to send money online. You can send money to almost anyone with an email address or a mobile number. The person will receive a notification with instructions on how to claim the money. Refer to the notification that was sent to your email address or mobile number. Certain transfers you make using People Pay can happen in real-time, instantly. If your transfer can't be processed immediately, it will only take one business day to process. Using People Pay is FREE! Sign up today through Account Manager located in Online Banking. What does DCU People Pay do? People Pay is a person to person funds transfer program that allows DCU members to transfer money from their accounts at DCU to a person either here at DCU, or another financial institution. What does it cost to use People Pay? Nothing! 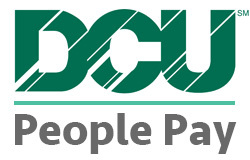 DCU People Pay is a free service for DCU members. Certain transfers can happen in real-time, instantly. If your transfer can't be processed immediately, it will only take one business day to process. You can transfer up to $400 per transaction with a $600 maximum transfer amount per day. You can transfer money directly to your recipient's financial institution if they provide you with their routing and account number. If you don't have that information, the recipient will get a text or email with instructions to claim the transfer. Can I use People Pay with the DCU Mobile App? Yes! DCU People Pay is available through online banking as well as the DCU Mobile App. Signing up for DCU People Pay is easy! Simply log into Online Banking and go to Account Manager. DCU People Pay will be on the left side of the screen. For mobile users People Pay can be found in Account Manager once you have logged in. People Pay is rated 4.1 out of 5 by 124. Rated 5 out of 5 by Formula206 from I am able to pay installments The tool is great for paying an individual. I am also able to make the payment recurring so I do not need to go in and send payments at my designated frequency. Rated 5 out of 5 by NHMember from Easy to use and convenient This product is easy to use and convenient when you need to pay someone quickly and don’t have cash with you. Rated 5 out of 5 by Regan from Great Definitely easy to use and very convenient. Would like to see a larger amount to be allowed to transfer. Rated 5 out of 5 by Jin from Much faster than ACH with less restrictions than other P2P platforms I send to Paypal instantly or to my external accounts in 1-2 business days with People Pay. This latter bank-to-bank transfer is great in that the receiving banks don't put the normal 1-2 day hold on these funds. And no, your other bank doesn't have to offer People Pay for it to work. So it's faster, cheaper, and more versatile than Popmoney right off the bat. I don't even know why Popmoney is popular -- that service just helps banks make more money off of you. People Pay doesn't -- it's customer-centric. I just wish the transfer limits were higher. Rated 5 out of 5 by Laurie19 from Great! Very easy and convenient. Love having this feature. Other people I make the payments to wish their bank offered this. Rated 5 out of 5 by MJ from I like people pay I like using people pay as mailing a check is not always the most fastest way to get things done. That being said I wish the cap was higher, perhaps $1,000 instead of $500. Rated 5 out of 5 by Big H from Excellent so easy It is so easy to use I just love it you can't find anything better. Rated 5 out of 5 by BGK from Super Pay No transaction fee even to a different bank account, what else? Also, it is fast. If I send $100, will you charge anything to the recepient? What is the transaction fee for the recepient? Nope! Each time you set up an individual transfer it will tell you whether there's a charge or not. When I set up a payment to a contact to be deposited in their account, there is no fee for me or for them. I actually don't know if there's any method that DOES charge a fee, as all the options I've tried have no associated fee. Will there be any charges if i send money to my friend from DCU to other babk account? ? DCU does not charge any fee for this service. It is absolutely free. Also BofA will not charge any fee as it is incoming transfer for them. Can I send money from my DCU account to my own Chase account using this service? Yes you can send to chase. You need to add your external account in people pay and usually take a day or two to credit the money. What method DCU transfers money (wire/ACH/otherways) to the recipient? I would like to know what method DCU transfers money (wire/ACH/otherways) to the recipient? Why I am asking this is, some banks charge an fee for incoming money. Knowing exactly how the money gets transferred (within USA) will help the recipient to check with his/her bank to make sure they understand the amount if there any fee. Definitely not wire, as I wasn't charge incoming wire fees from the receiving bank. My receiving bank says &quot;ACH deposit&quot;, but I'm thinking it may be a direct deposit, because that bank normally holds regular ACH funds for 1-2 days before releasing it to me for a total transfer time of 4 days. People Pay's transfer takes 1-2 days for me to have actual access to the money when it arrives at the other bank. "Online Banking is SO easy to use!" DCU has always been miles ahead of the competition when it comes to online banking and their years of experience with it definitely shows in the clear, easy to use interface to their products and services. I've had nothing but good experiences with DCU. People Pay Disclosures  Learn about DCU People Pay terms and conditons of use. CashEdge Funds Transfer  Move money between your DCU accounts and your accounts at other financial institutions. Email money to anyone. Bill Payer  Save money with every bill you pay. It's fast, easy and secure! DCU Text Alerts  We'll send you a text message to let you know that you are in danger of bouncing a check, your loan payment is due, or if your balance falls below a certain amount. You choose which alerts that you want to receive! eStatements  View, print, and save your statements electronically through Online Banking. Money Management  An easy to use tool designed to help you manage your everyday finances all from within Online Banking. Mobile Banking  Access your DCU accounts with smart phones, iPads, and internet-connected devices. Online Deposit  Deposit checks free with the camera on your smart phone or iPad, or a computer scanner. StreetWise Privacy Protection and Fraud Prevention guide  Learn how to protect yourself online from identity theft and fraud.